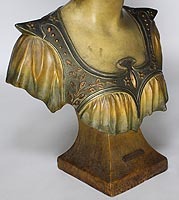 A Fine French 19th-20th Century Art Nouveau Polychromed Terracotta Bust of "Crépuscule" (Twilight) After Henri Jacobs (Belgian, 1864-1935) version of Crépuscule, depicting a young maiden with head and body armor, by Salesio Lugli (Italian, 1869-1936). Signed: Salesio. 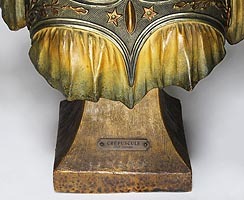 A brass plaque reads: "Crépuscule par Jacobs". Circa: Paris, 1900. 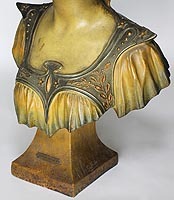 Salesio Lugli was born in Capri in 1869 and died in 1936). He was probably the son of the painter Alabano Lugli (b.1835). He possesed an atelier in his hom town of Capri, where som of his works are now exhibited at the Museo Civico "Giulio Ferrari" and the Museo del Palazzo del Pio. 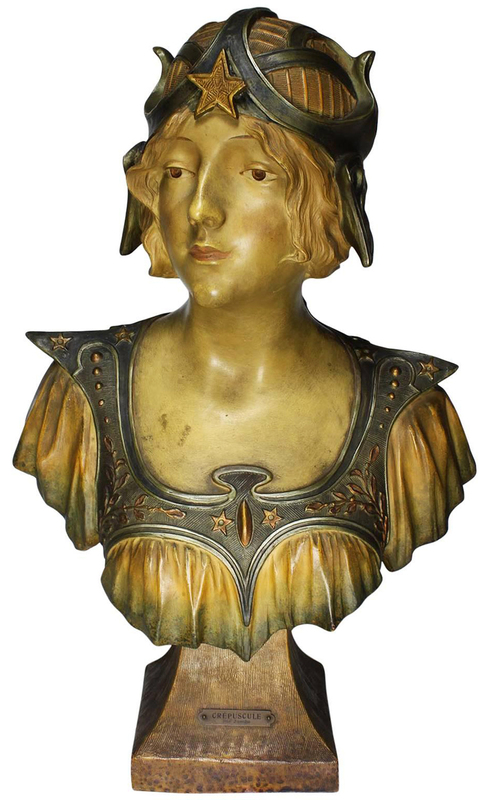 He worked in Paris from around 1900, producing a number of sculptures in bronze and ivory, pewter and porcelain (Ceramic-Terracotta). 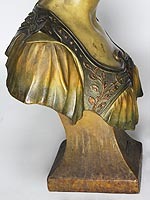 He is known for his historical models (French Revolution, Napoleonic war: esp the "Veille de Wagram" bronze lamp) and for his art nouveau maidens. 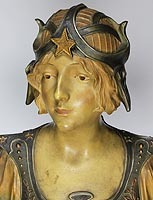 He exhibited twice at the Société de Artistes Français. 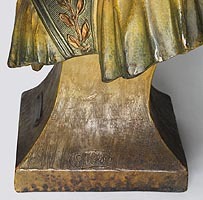 Around 1906 he became director of the ceramics firm known as the Société des grés de Charenton L.M. Barthe and Mettais-Cartier, sided at Charenton-le-Pont, in the Seine valley to the south-east of Paris. He collaborated with the artists Camelo Cernigliari Melilli, Aristide de Ranieri, Affortunato Gory and Ezio Sighieri. 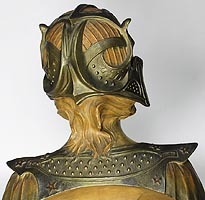 Luigi returned to Italy following the outbreak of the First World War and, in 1915, he was made knight of the Ordine della Corona d'Italia.